685 developmental skills and behaviors (0-3) provide a comprehensive framework for ongoing assessment, planning and tracking progress. 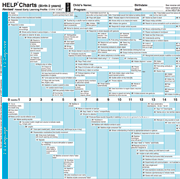 HELP domains include Cognitive, Language, Gross Motor, Fine Motor, Social-Emotional, and Self-Help. Supports Federal Requirements for Part C of IDEA, and, Early Head Start programs. HELP domains and Strands are aligned with OSEP outcomes and Head Start five essential domains and school readiness goals. HELP 0-3 products are cross-referenced through skill ID #'s for easy linking between assessment and curriculum materials. Data Reporting for Early Head Start: Comprehensive progress reporting system through KinderCharts measures developmental progress in essential domains and school readiness goals. Learn more. 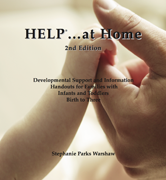 Inside HELP, HELP Strands 0-3 or HELP Strands 0-3 Plus, HELP at Home.